What does the “filter active items only” checkbox do on reports? It doesn’t seem to change anything. / Reporting / What does the “filter active items only” checkbox do on reports? It doesn’t seem to change anything. By default the time centric reports in Intervals will display time for all active and inactive items. This is done by design so that when you run a report you can trust that all of the data is there without having to remember what was active during the time frame. Time for BOTH active and inactive items will show up. 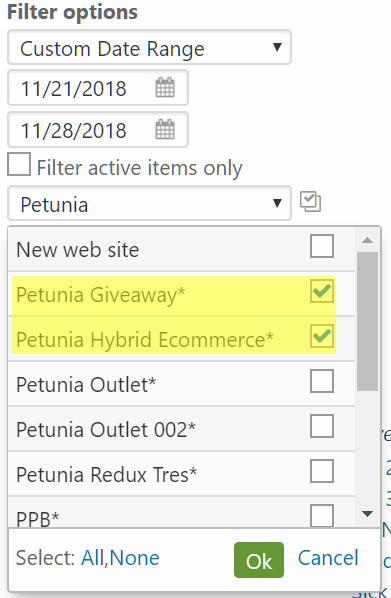 The “filter active items only” checkbox controls what shows up in the drop down menus below. This checkbox limits the drop down menus so that they show active items only by default. If unchecked the drop down menus will cascade and update to include all active and inactive clients, projects, people, etc. Un-checking this allows you to select inactive items to run reports specifically on inactive items. An example or two may help. Say you run a report to see all hours for January by project. After looking at the data you want to run a report for a certain project that is inactive and a certain person who is inactive. By unchecking “filter active items only” the drop down menus will update so that you can select inactive items to run reports on. Say you want to run report for January and only show active projects for an active client. 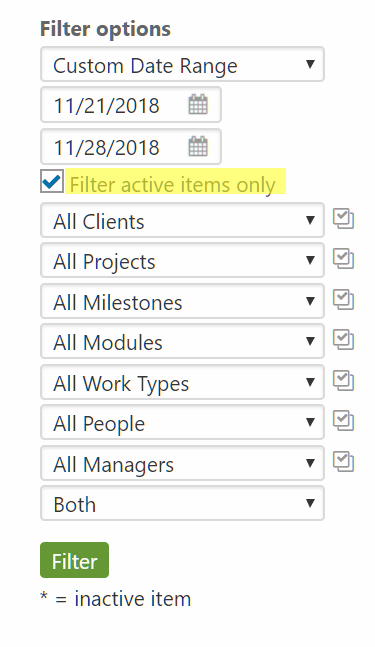 You can leave the “filter active items only” checkbox selected. 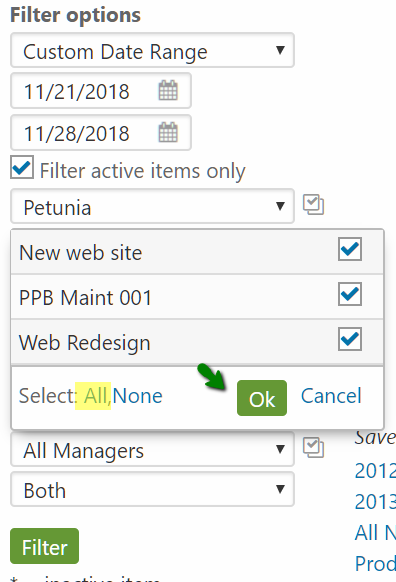 When picking the projects you can select the all option to select all active projects only. With this filter any inactive projects for the client will be excluded from the results. If I deactivate a client what happens? How do I change an Inactive project to Active? How do the active project limits work?